PT Bank Pembangunan Daerah Jawa Tengah - BPD Jateng or known as Bank Jateng is a reputable regional government owned company in Indonesia, running business in general banking industry. Bank Jateng is a regional development bank of Central Hava Province and based in Semarang Central Java. Bank Jateng is owned together by the Government of Central Java with all the Government of City / County in Central Java. As at the end of December 2017, Bank Jateng is 56.42% owned by the Central Java Provincial Government, and 43.58% by the Regency and Municipal Governments in Central Java Province. Started to establish since April 1963, Bank Jateng now has 36 conventional branch offices, 124 sub branch offices, 169 cash offices and 781 ATMs. Bank Jateng also supported by 5 sharia branches, 14 sharia sub branches, and 12 sharia cash offices (as of December 2017). Bank Jateng's head office is registered at Jl Pemuda 142 Semarang. In 2017, Bank Jateng recorded a satisfactory performance growth. According to information found in PT Bank Pembangunan Daerah Jawa Tengah Annual Report 2017 as cited by JobsCDC.com, Bank Jateng posted an increase of 19.94% in total assets from Rp 51.24 trillion in 2016 to Rp 61.47 trillion in 2017. Total loans in 2017 worth of Rp 42.45 trillion, or up 17.39% from Rp 36.16 trillion in 2016. Referring to its annual report, total net income in 2017 amounted to Rp 1.19 trillion. This total net income represented an increase of 21.49% from the previous year of Rp 980.77 billion. Maximum age of 27 years old for CO, SO, RO positions, and a maximum age of 30 yearsold for UH position. Physically and mentally healthy and free from the influence of narcotics and other addictive substances. Have high enthusiasm and fighting power, and target oriented. Good behavior and have never been convicted of a crime. Does not have bad credit at a banking company or other financial institution. Not a member and / or active in political party activities. Willing to be placed in all work units of Bank Jateng. JobsCDC.com now available on android device. Download now on Google Play here. Please be aware of recruitment fraud. The entire stage of this selection process is free of charge. 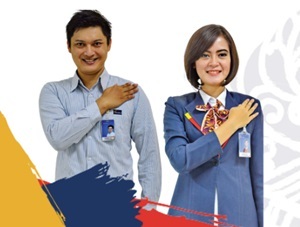 Bank Jateng - D3 Fresh Graduate, Experienced Officer, Head Bank Jateng January 2019 will never ask for fees or upfront payments for any purposes during the recruitment process such as transportation and accommodation.